Today, MTS, the biggest telecom company in Manitoba, launched a rebranding campaign centered around a renewed focus on the customer and headed under a new slogan. “We’re with you.” deftly signifies what MTS is shooting for as the company heads into the future. Jaclyn and I had the incredible honour of being part of this rebranding campaign. Around Christmas, we were contacted in regards to a photo I had posted on Flickr over a year ago that would later become the main landing image of this rebranding campaign. I’ve heard from some folks today that the photo has appeared on Instagram as an advertisement, on MTS’ main web page, and on billboards across the province. In the MTS Connect store next to our office, her face is on a few posters on the wall. You can check out the website here if you’d like. It was an awesome experience and such a pleasure to work with the department who put this campaign together. All the people Jaclyn and I worked with were passionate about their work and cared for the life of the project. Their work should be commended. I’m super proud of Jaclyn for braving the unbearable cold with me. We had to head back to reshoot the photo, and the only day that resembled the day from a year ago was an excruciating -40C day. It was a trek, but one both Jaclyn and I were super excited to endure. 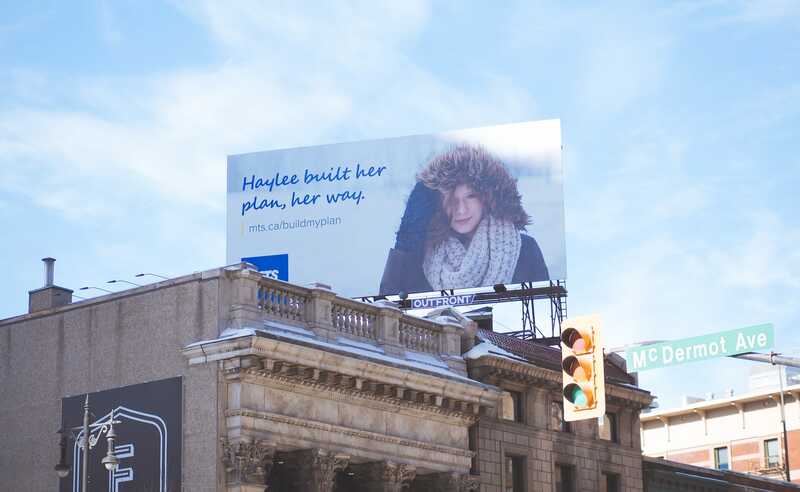 Update: The billboard was put up shortly after February 3 just north of McDermot Avenue on Main Street in Winnipeg. A few people giggled at us as we took photos of the billboard. Frankly though, the joke’s on them.